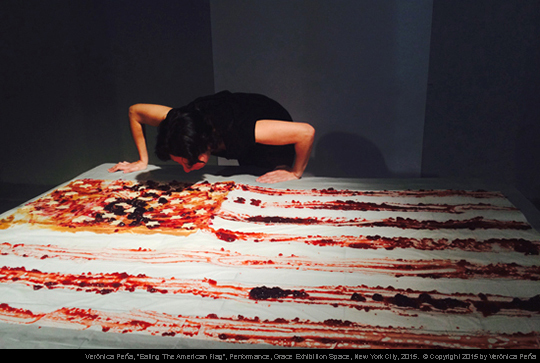 For this performance I made an American flag using peanut butter, jelly, and white bread, in imitation of the traditional American peanut butter and jelly sandwich. After I made the flag, I attempted to eat it. I ate for more than an hour, but I could not finish it. My intention was to portray how the American Dream can start as a sweet experience and become a cloying nightmare for immigrants. Many times we force ourselves to embrace a culture other than ours because we foresee a brighter future. However, this embracement often also means the separation from our own culture and family, and as it happens in the performance, it might end with the exhaustion of the performer/immigrant.